The popular line of Walking Dead banks continues with its first human character! 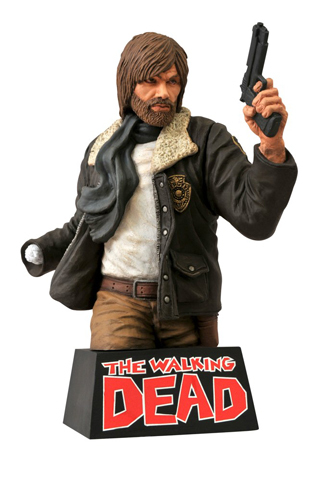 This 8-inch vinyl sculpture of protagonist Rick Grimes is based on his appearance in the acclaimed Walking Dead comic book series. The popular line of Walking Dead banks continues with its first human character! This 8-inch vinyl sculpture of protagonist Rick Grimes is based on his appearance in the acclaimed Walking Dead comic book series, and while it looks like a bust, it's actually a bank, with a coin slot in the back as well as an opening in the base! Factor in Rick's collectible-quality paint and sculpting, and your zombie banks won't stand a chance! Sculpted by Eli Livingston!